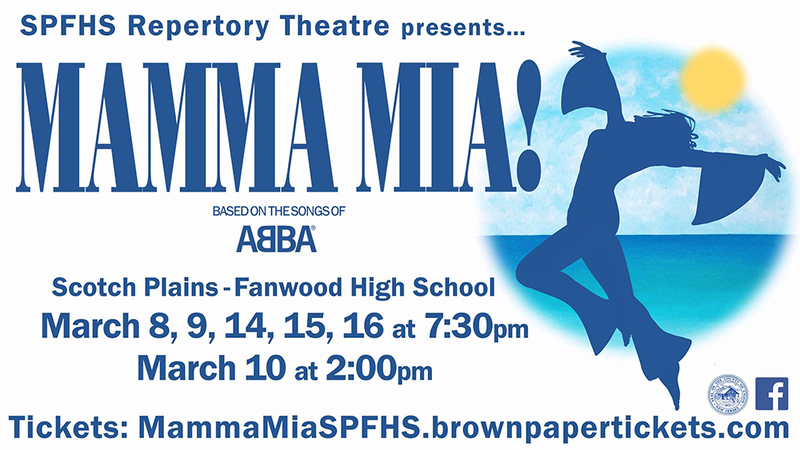 The SPFHS Repertory Theatre is proud to present this year’s production of the Broadway hit musical Mamma Mia! This jukebox musical is told through the effervescent and enchanting music of ABBA. It has become a theatrical phenomenon, with audiences around the world dancing in their seats. Performances will be held at Scotch Plains-Fanwood High School, located at 667 Westfield Road in Scotch Plains, on Friday, March 8; Saturday, March 9; Thursday, March 14; Friday, March 15; and Saturday, March 16 at 7:30 p.m. There will also be a matinee on Sunday, March 10 at 2:00 p.m. The story takes place on a small Greek island where Sophie dreams of a perfect wedding — walking down the aisle with her father by her side. But how can that happen if the bride-to-be doesn’t even know who her father is? Upon sneaking a peek in her mother’s diary from the 70’s, Sophie discovers three paternal possibilities: Sam, Bill, and Harry. She is so convinced that she’ll know who her true father is when she sees him, she secretly invites all three to the wedding. Yet when the trio arrives, the only thing clear is that finding her dad is going to be far more of a challenge than she could have imagined! Tickets are now on sale for Mamma Mia! at mammamiaspfhs.brownpapertickets.com and are $13 for students and senior citizens, $15 for adults. All tickets for the performance on Thursday, March 14 are only $10. Senior citizens with “Gold Cards” may contact Kathleen Sheehy at ksheehy405@gmail.com to make arrangements for discounted tickets. 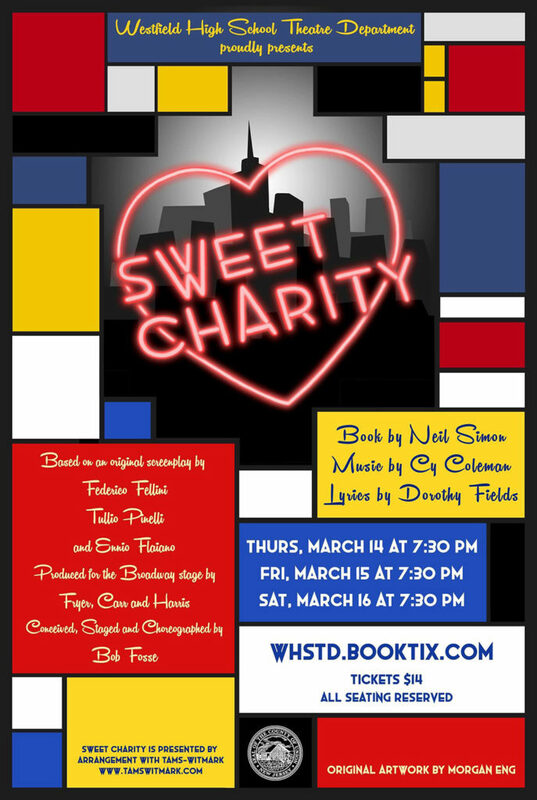 The Westfield High School Theatre Department is proud to present Sweet Charity, book by Neil Simon, score by Cy Coleman, lyrics by Dorothy Fields, and original choreography by Bob Fosse, on Thursday, March 14, Friday, March 15 and Saturday, March 16, 2019. All performances are at 7:30 p.m. Tickets are $14 and can be purchased at whstd.booktix.com. All seating reserved. Inspired by Federico Fellini’s “Nights of Cabiria,” Sweet Charity explores the turbulent love life of Charity Hope Valentine, a hopelessly romantic but comically unfortunate dance hall hostess in 1960s New York City. Charity is determined to change her life for the better after being unceremoniously dumped by her latest boyfriend Charlie. Singing, dancing, laughing and crying her way through one misadventure after the next, Charity joins a host of other vibrant characters as she embarks on a wild ride and quest for love. In the end, Charity realizes, as many of us do as well, that the real answer to happiness lies somewhere inside her hope and her heart.